FrontSigned to Frontiers Records ! 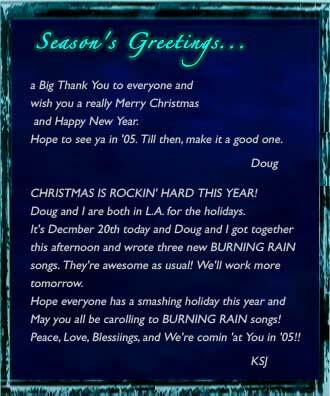 Burning Rain have signed to Frontiers Records (Italy) for a new studio album in 2005. You can listen to Doug's guitar riff at Guitar World and read the column and see the printed tab in the July issue (on sale now in the US). I want to wish everyone a Happy New Year and look forward to seeing everyone soon. Whitesnake is planning out the year as far as the Touring schedule. We are definitely working on Europe, South America and maybe even Australia. We will let everyone know as soon as anything is planned and definite. And of course I am hoping some US dates come in for the end of summer. I have been working on a new Burning Rain record that will be recorded this year. Thanks to everyone who has been waiting. We basically wrote a whole bunch of new songs and just wrapping up the loose ends. And lastly, everyone should pick up the Dio DVD "Evil or Divine" from the 2002 tour. Recorded on Friday the 13th. We will be finally implementing the online ordering of merchandise (DougAldrich.com), we are working on that now. More news very soon! Doug Aldrich's Guitar instructional video The Electro-LESSON DVD (Original VHS was released in 1997) will be out on Feb.18th in Japan. Check out his awesome guitar plays!